What's your stand on copy-cat companies? You know the ones that release products that look similar or exactly identical to another brand's? 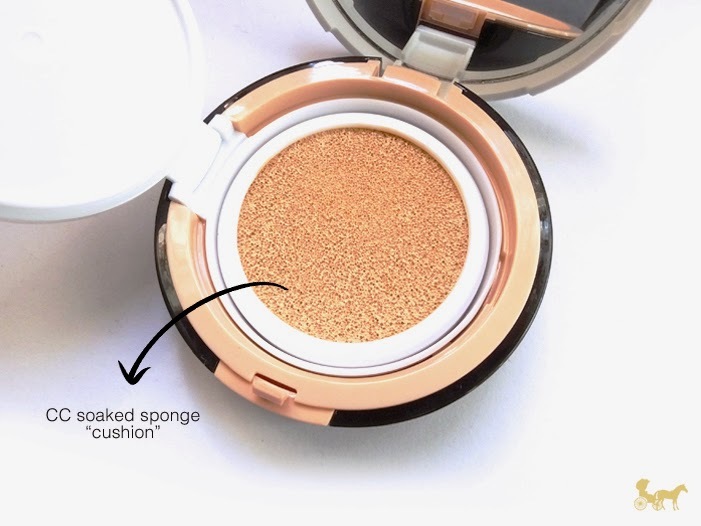 If you've read my recent haul here, I've finally acquired the number one (in terms of bases) cosmetic darling in Korea that's also currently gaining traction in the US — the cushion base. This beyond pretty compact reminds me of Harley Quinn and Harlequin (not to be confused with the books) and I love the design to bits as if you can't tell by now. Going back to my opening statement, companies do copy other brands, especially if they've come up with something new, innovative and/or highly salable. And obviously this compact is no different. 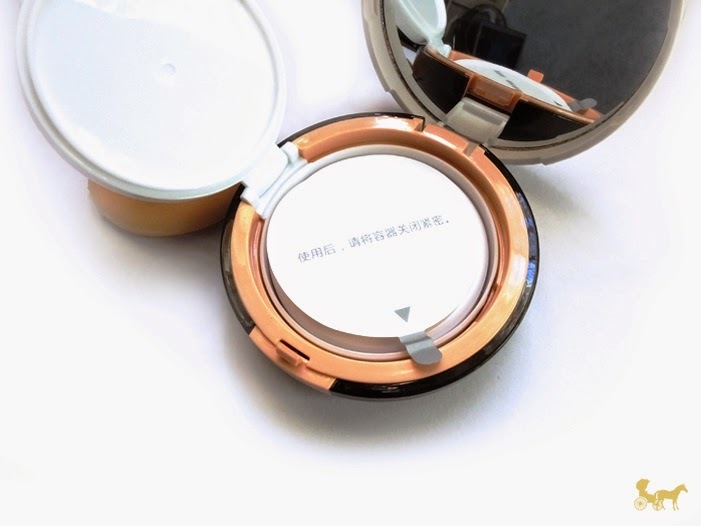 This one is actually an exact copy of the "Hera" limited edition compact I've been lemming ever since I saw it online a couple of years ago. As I've said before in one of my posts, I don't know if I'm happy that they outrightly copy on the other hand it makes for some friendly competition and more affordable options. 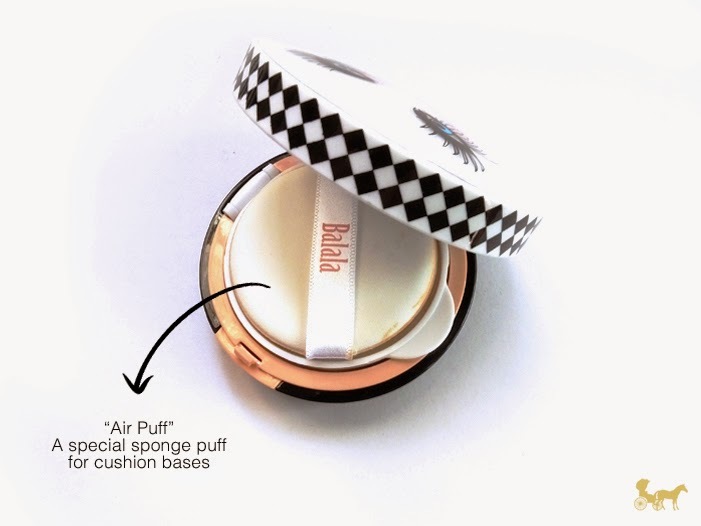 This CC cream has 15 grams, typical amount for most cushion bases I've seen and includes a refill cushion in the box. I'm in the darkest shade (#23) and you guessed it, it's still too light. The compact is sturdy enough. Not that it's a little flimsy but it does wobble when you turn the mirror enclosure from side-to-side — naturally. Duh CJ. This "air-puff" business is new to me. The texture is quite different from the other "regular" puffs including Korean ones that I've tried. It's like it doesn't absorb that much product which should be a good thing but I don't like this particular puff very much. I guess I'm just not used to applying base products a little at a time. I've tried a synthetic buffing brush and it works quite well with it. Germophobes won't be able to stand the sight of a soaked sponge that you dip your puff into periodically during the day. I honestly wasn't too concerned about that when cushions first came out. 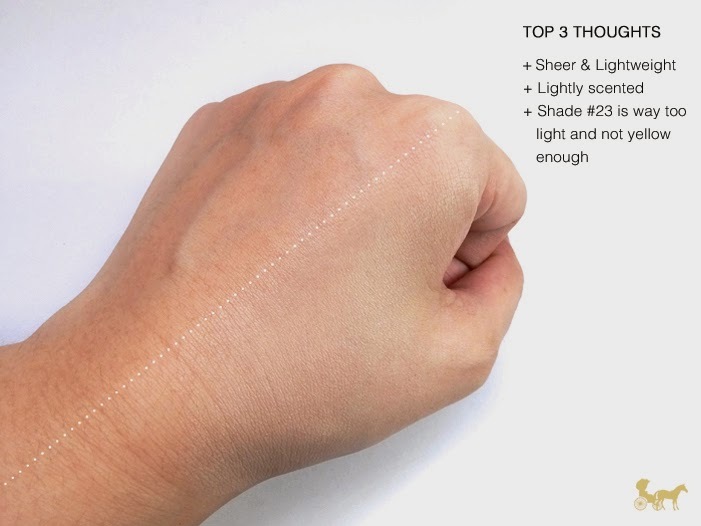 As you can see it's very sheer but easy enough to apply. I have to warn you though, this isn't a summer CC cream. It doesn't blend easily onto the skin because of heat outside and/or your body. Apply sparingly and in light sheer layers, wait to dry then apply more if needed. Set immediately as this leaves a dewy finish. To avoid cakey-ness use as a primer similar to the texture of your base. Use a synthetic brush and buff in for faster application. Here it is on my face. I have a lot of redness on the sides of my nose and some on my cheeks (left image) . Aside from the fact that it made me about 100 shades lighter, it was able to neutralize the redness (right image) and lighten my bags a smidgen. The color does settle and darken after a while but it's still noticeably lighter. 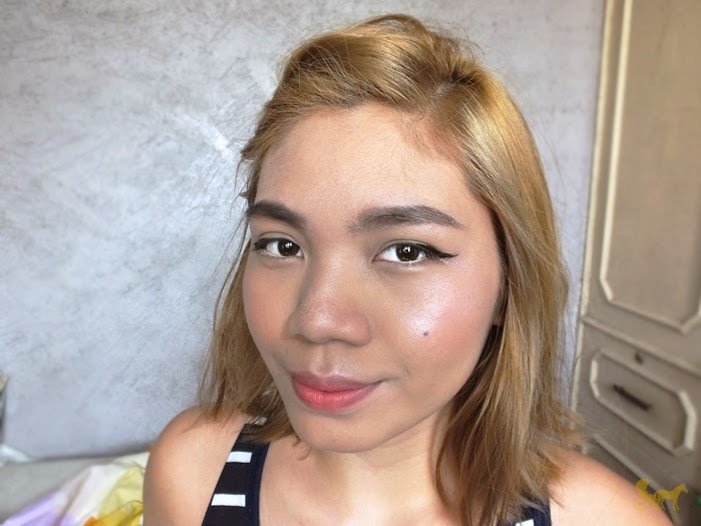 Here is my look after neutralizing the liquid base with a darker face powder, adding some blush, eyeliner and putting on a tonne of highlighter. 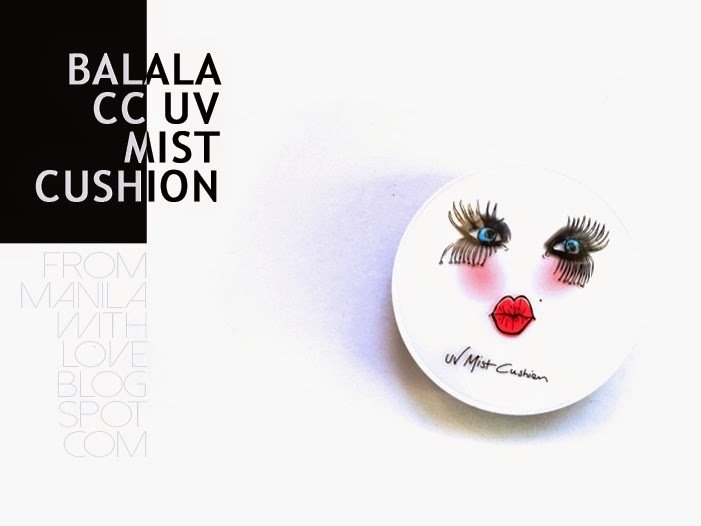 The CC cream has a pink/neutral tone to it so some areas of my face appear grayish especially in person. My skintone is yellow-olive so my face bases have to have enough yellow and/or yellow-green tones in it. It wears the whole day but doesn't look as good as initially applied under the current heatwave. I would recommend it to people who live in cooler places and like dewy and sheer finishes. Add to the reasonably affordable price of $14.66 $8.80 plus the discount code (CJSH10) and free shipping it's a pretty good bargain if only just for the compact itself. You can just put in your preferred foundation/bb/cc (which is what I did after reviewing it :P ). PS. What's your stand on copy-cat companies/products? PSS. 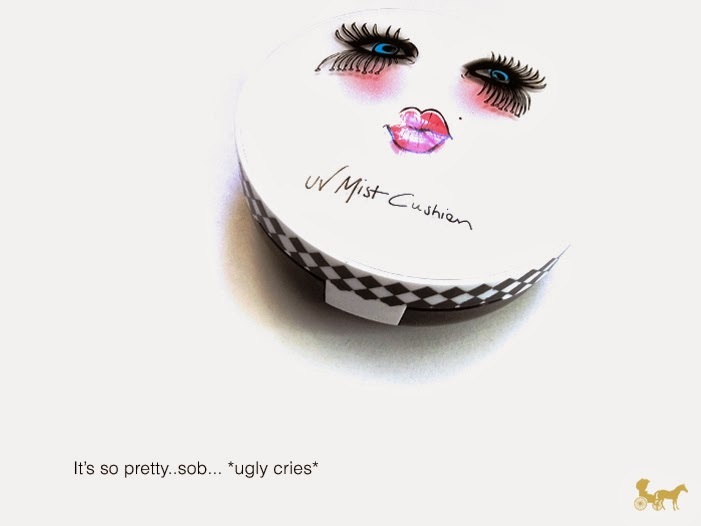 What do you think of cushion makeup in general?